When it comes to measuring the intensity of hurricanes, the most widely understood metric is sustained wind speed, and this morning Irma has regained some strength, to 130 mph. However for scientists, the more accurate determinant of intensity is central pressure—the extent to which a storm’s center is lower than the Earth’s normal sea-level pressure of 1013.25 millibars. This morning, Irma’s central pressure has been hovering just below 930 millibars. Although far from a record, only six US hurricanes have made landfall with pressures below this—The Indianola storm, the 1919 Florida Keys hurricane, the 1935 Labor Day storm, Camille, Andrew, and Katrina. All are legendary storms. This provides some sense of what is now crossing the Florida keys and moving toward the Florida peninsula. Irma finally turned to the north-northwest on Saturday night. While the delayed turn was a surprise to some, we have been discussing the possibility of Cuba-then-southeastern Gulf of Mexico scenario since last Tuesday. The Cuba interaction weakened Irma substantially, from 160mph down to 120mph, but since moving back into the Florida Straits on Saturday afternoon, the storm has begun to regain some strength, to 130mph as of 7am CT Sunday. Fortunately, the window for restrengthening is short. Later today Irma’s center will begin to interact with the southwestern part of Florida, and this will disrupt the storm’s organization. Another critical factor is wind shear, the varying direction of wind speeds at different levels of the atmosphere. Irma has had a very smooth go of it for days (less than 20 knots). But it has now reached an area of higher shear (shown above), and this should help to weaken the storm considerably over the next day. Here’s the official forecast for winds over the next three days as Irma moves inland. 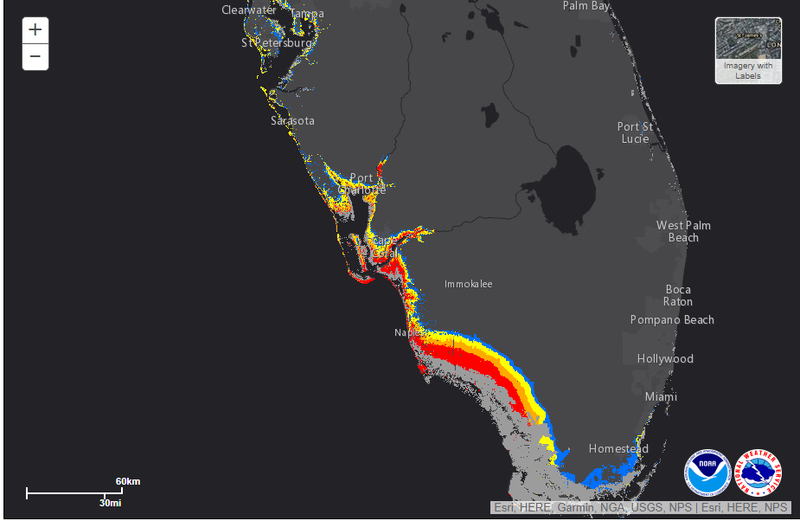 From looking at this map, the largest concern is substantial storm surge in the Fort Myers area, and salt water intrusion into the Florida Everglades. 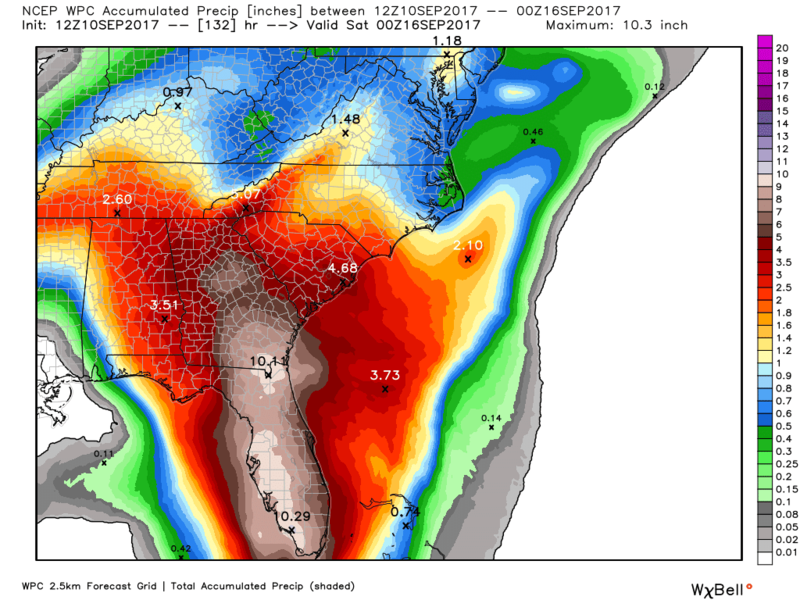 The final, significant concern is inland rainfall, with much of Florida forecast to receive 10 inches of rain (and considerably more in isolated areas) during the next few days as Irma move up the west coast of the state. 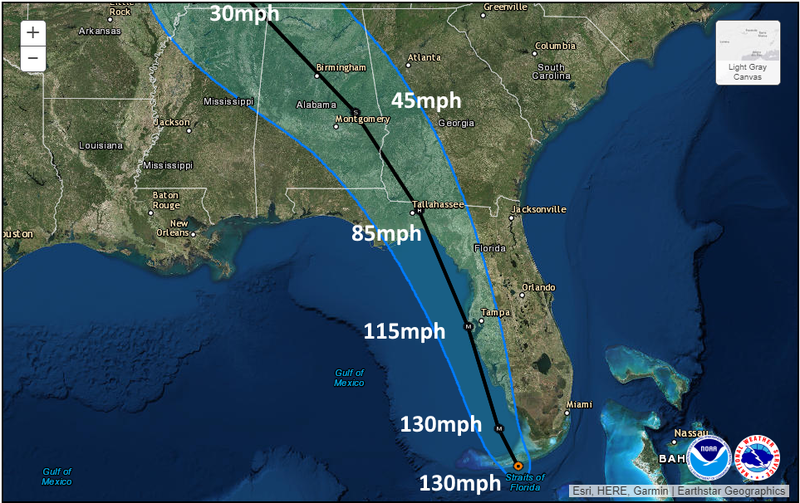 In short, this will be a disastrous storm for Florida. While it is certainly “better” that a 130mph hurricane is coming to the state than a system with 175mph winds, it is still going to produce catastrophic, widespread damages. Thanks Eric. My family is hunkered down and thankfully had time to get to Tampa and get their granddaughter from college and home with them to Melbourne. Appreciate being able to come to your site and read what’s happening. Hoping everyone is safe on the other side of Irma. I know that we all greatly appreciate all the no-nonsense coverage of both Harvey and Irma provided by Space City Weather. Both storms have been mind boggling. Has this happened in other massive hurricanes? We were in Boca Grande FL when Katrina was coming across very southern FL. The storm had inhaled and drawn the water 100+ yards off the beach. People were running out, harvesting hundreds of crabs right off the sand. I know it’s happened at least twice in Mobile bay. I can’t remember the storms, but I believe it was Federic and Danny. Fredrick was a major storm but Danny was an unimpressive storm. Both drained the bay. They just showed photos of the same thing in Tampa Bay. do you have a link to that Cindy? You were recommended to me by a friend in Houston. I have been following you for days. Thank you. I appreciate you. Irma is headed straight for us. We’re in Belleair, FL, which is 10 miles west of St. Pete. I am sorry to hear that, Lisa. I wish you well during the next 24 to 48 hours. We have family in Sarasota…I think this storm has potential to slide into any area along the west coast…and even w/o a direct hit, being in the eye zone with the highest winds/damage and the stronger storm surge means no one is much safer than anyone else. Thanks Eric. Any word on Jose? We have friends on St. Martin. Not much information available since Irma is hitting the US. I was going to ask the same because the forecast track is showing Jose doing a circle and heading back towards the US. You continue to provide accurate probabilities without hysteria. That allows us to make reasonable decisions on personal safety. We have family in Houston, and now Lecanto FL that are in the hurricane paths. You discussed the Cuba/west FL coast path all along, and so she wasn’t caught off guard as the storm moves her way. Even when you had to deal with your own hurricane impacts you kept us informed. Not sure how to express to you what your sanity provides in scary situations. Thanks. Just thanks! I also have family in Lecanto. Praying! Thank you Eric. I have been following you for a while. I appreciate this report on Irma as my sister and niece live in Melbourne, Florida. They evacuated to Orlando so it looks like they will still get rain like the entire state but nothing like Tampa, the keys and Fort Meyers. So grateful for your forecasts! I live just outside of Savannah. My daughter writes for the Houston Chronicle and recommended your ‘no nonsense-common sense’ approach – which has been greatly appreciated. Thank you for your knowledge and your measured attitude toward this manifestation of Nature’s ultimate strength. We have family and friends who are still dealing with Harvey’s Gulf landing and its Houston flooding. Now Irma imperils our daughter and her family in Sarasota, where we also own a vacation home. My husband and I are in DFW, tethered to Irma’s coastal progress like rubberneckers on the freeway. 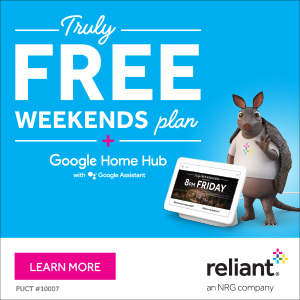 As a young teen, I lived in central Texas south of Austin. We had family in Sweeny near the coast who evacuated from Hurricane Carla to our house 160 miles away. I still remember vividly the sounds of the winds from Carla beating our small wood-frame house for hours and hours…and then quiet. The eye passed through our area and the quiet was surreal. We went outside to hear nothing except the ringing in our ears. Our relatives’ experience with hurricanes cautioned us it wouldn’t last long. So we went inside for the second half of Carla’s performance. Because of the potential for tornadoes, when the winds slowed enough to drive, we went to the “safest” location in our very small town (one-blinking traffic light) a high school. We were lucky and no one was physically hurt; our house only lost some shingles. Carla finished up in Canada almost a week later. Our relatives went home to discover their parting gifts from Carla. a Biblical punishment for the losing side. I imagine in addition the billions of dollars of visible physical damage, and the immeasurable emotional pain—many gardeners along both coasts and the Caribbean will discover in their gardens a lingering reminder of Harvey and Irma’s power to influence Nature. Hopefully the most powerful good to percolate through the destruction would be a serious acceptance of the absolute necessity to acknowledge the threat and presence of ongoing global climate change. What would the spaghetti models offer on those odds? Thanks for letting me vent. My family has made it to their “bunker”. Irma continues her voyage of destruction. And we wait. Eric or Matt: now we are wondering if the rain we got in Harvey was seawater? Should we expect ill-effects on our lawns and shrubs? Or would we have noticed that by now? Eric, great reporting as usual. As a Houstonian and a newbie to major storms and hurricanes, following you as Harvey developed and struck our state was a way of remaining sane amid unnecessary hype communicated by some of the mass media. Grateful for your service and no-nonsense approach. There once was a time when 10 inches seemed like a lot of rain. I remember after Ike there was discussion of a parameter called Integrated Kinetic Energy, or (ironically) IKE, that looked at the total energy content of the storm. How do total energy measurements like this stack up in comparing storms? I agree the Saffir-Simpson windspeed scale often tells little of the story.